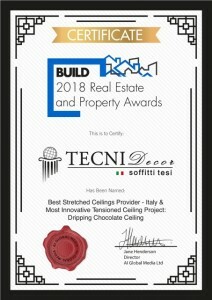 TECNI DECOR stretch ceilings is a company specialized and certified in stretch ceilings walls design, installation and post-sale maintenance. We have been leading in dry-stone walls and interior design market for 25 years, developing very good skills both on national and international scale. We offer our customers innovative and stunning products, paying attention to any detail from beginning to end. Our strengthen is to create exclusive surfaces which turn to be the main figure in the interior design setting. We can provide tailor-made stretch ceilings, walls and frescoes through personalized tridimensional printings enabling to create amazing settings (i.e. sky, clouds, fish tanks, landscapes etc.). Stunning mirror ceilings in many colors, tridimensional and viewing pleasure structures are just a dream coming true with us. TECNI DECOR is pure passion mixed with attention to details and originality. If you are looking for unique settings, then you are in the right place. TECNI DECOR operates both on national and international scale. Throughout the years, we have been cooperating and satisfying the requests of our customers coming from Italy, France, Germany, Kazakhstan, Estonia…probably the only one missing is YOU!